As a child growing up in New Jersey, the Mennen Arena was this vaguely referred to place where the WWE (then the WWF) would occasionally hold a house show. I never went there as a kid, but somehow I never forgot the name. So when the opportunity came up to attend an event there this past weekend, the little kid in me got just a little curious again. However, it wasn’t Bret Hart or Shawn Michaels headlining the event but rather names like Greg Hildebrant, Neal Adams, Mark McKenna and yours truly, J. M. DeSantis (well, maybe I’m not a headliner yet, but I’m hoping my time will come). The Garden State Comic Fest (hosted by Dave O’Hare) was held on this past Saturday and Sunday. Though the Mennen Arena turned out not to be the mammoth coliseum I always dreamed it was when I was a kid, it was certainly big enough for a decent-sized show–not too small, but not the dizzying, hustle-fest that is the New York Comic Con. The crowds came in ebbs and flows and so did the sales, but it’s difficult to judge a convention the first time around, especially when they’ve changed their venue that same year and especially considering I’ve sort of worked backwards in the way I’ve attended conventions. I started out exhibiting at big shows and have slowly tested the waters with smaller shows as time has gone on, against most of the advice I’ve later read, but, hey, whatever works. As always, it was great to catch up with some old friends and meet some new people in the industry. I always enjoy the opportunity to say hello to Billy Tucci and Mark McKenna. Name-dropping, I know, but still, they’re two really great guys who I’m happy to be acquainted with (Billy who I was introduced to early on in my career by a mutual friend and Mark who gave me my first portfolio review). Besides them, it was good to see the amazing Sean von Gorman, writer Amy Chu and my table-neighbour, Emilio Velez Jr. (creator of Dodgeball Teens). I also had some wonderful conversations during the slower moments of the show with, fellow artist and teacher, Michael Grassia (whom I met for the first time) and Mr. J.D. Calderon (creator of The Oswald Chronicles). Even more, I enjoyed my dinner out on Saturday night with my girlfriend, her daughter and fellow creators Alex Rivera, MAS Media Studios’ Jorge Medina and Jonathan Syphax, James Rodriguez (creator and artist of Sara Rising), Chris Duckett and Paris Cullens. It’s been a while since I went out after a show with colleagues, and I’ve known some of these guys for a long time, a few of them since I first started working professionally. I had a great time, so thank you all. We have to do it again, for sure. Over all, the show was okay and chances are I might do it again, especially since these New Jersey shows cost me little more than the table price to attend, but I’ve got time to decide. Right now I’ve got to get in some work in the studio and then it’s up to Boston in just a few days for this weekend’s Boston Comic Con (bostoncomiccon.com). Then, the following weekend, I’m driving out to Long Island for Inbeon Con: Summer Edition (inbeoncon.com). 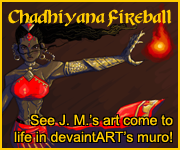 As I’ve said before, it’s a busy and exciting summer, what with three back-to-back conventions, Chadhiyana #1 having been published this month, and issues 2 and 3 in various stages of development (issue 2 should be out in September, based on the bi-monthly schedule Rosarium has planned). So, hopefully I’ll see some of you in Boston or at Inbeon Con. 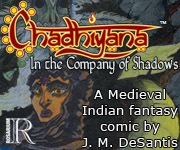 Otherwise, I hope many more of you are checking out Chadhiyana #1 and looking forward to issue 2.